By now, everyone knows about the Honor Flights conducted nationwide. They transport World War II veterans — and increasingly veterans from later wars — to Washington, D.C., to visit national war memorials and attend a Changing of the Guard at Arlington National Cemetery. If you speak to anyone lucky enough to be part of an Honor Flight, they tend to be fairly low-key in their expectations of what it will be like. Afterward, they’re changed forever. Phil Galdys is no exception. Galdys walked Veteran Voice through the whole, jam-packed, emotional day. Suzi Galdys takes a quick send-off photo of her husband Phil Galdys before he leaves for the West Palm Beach airport. Throughout the morning a total of 77 veterans and their guardians, volunteers and support staff would arrive to board an early flight to Washington D.C., two of whom were women and nine of whom were Korean War veterans. Galdys was assisting photographer Tony Cottrell, a Marine Corps veteran from Vero Beach, who was on his last flight with Southeast Florida Honor Flight before moving out of state. After the veterans checked in, they made their way to the 2nd floor. Portrait photos were taken of the veterans individually and with their guardians. Once on board the plane, a ceremonial “Flags of the Fallen” was held for three deceased veterans. This boarding ceremony was conducted by Army Sgt. 1st Class Daniel Hudnet and retired Palm Beach County firefighter Rick Gass. Hudnet held a folded flag for each veteran, while Gass held a large photo plaque for each. A moment of silence was held to honor the fallen, as Southeast Florida Honor Flight chairman, Todd Tucker, announced their names. As the plane started to taxi, it was flanked by two fire trucks, and it received a water-cannon salute. Water soared overhead in tribute to the veterans. A light breakfast was served for the short two-hour flight. While on the flight and throughout the day, veterans were interviewed by a video crew who documented the trip. Once they landed in Washington D.C., they were greeted with yet another water-cannon salute. Friendly people wearing fluorescent color t-shirts were throughout the crowd of hundreds that greeted them in Washington, D.C. They were the Honor Flight Ground Crew that is part of the Honor Flight Network. 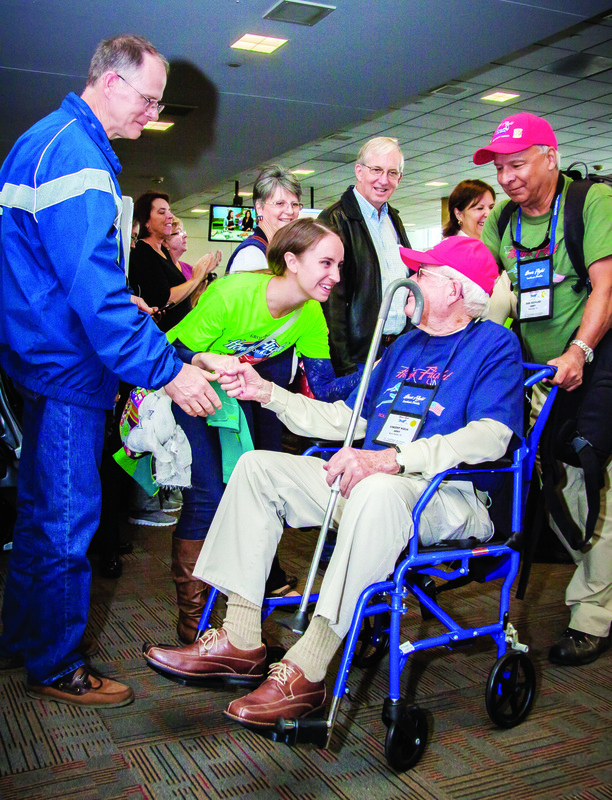 Just as all Honor Flight staff, they are volunteers. Big smiles, handshakes and salutes were offered to the veterans not only by the ground crew, but people that lined the terminal, in what would be one of several pep rallies of the day. World War II Army veteran Vincent Koch is pushed by his guardian, Army veteran Dan Aguilar, Palm City, as he shakes hands with an enthusiastic member of the Honor Flight Ground Crew and greeted by others during his arrival in Washington, D.C., Oct. 24 on the Southeast Florida Honor Flight. Todd Tucker, Chairman of Southeast Florida Honor Flight, used mobile technology and a service called Periscope to broadcast a live streaming video of the day’s events. Families, friends and supporters of the veterans around the world could follow along throughout their experience. Four chartered buses carried the veterans, complete with volunteer tour guides, who “gave background, D.C. history, and told a funny story or two,” he said. One thing that amazed Galdys was the fact that the D.C. Metropolitan Police coordinated the route so that “we didn’t have to stop at one single intersection,” he said. The first stop was the Iwo Jima Memorial, on an “overcast and brisk day,” Galdys said. “The Marine Corps Marathon was being set up for Sunday, so the area was peppered with runners, organizers putting up fencing, and sidewalks lined with pallets and pallets of water. There, a group photo was taken of all the veterans. The veterans were greeted by a troop of Boy Scouts. In recognition of his commitment and service to Honor Flight, photographer Tony Cottrell was given a moving tribute when Tucker presented Cottrell, a unique photo of D-Day Honor Flight veterans. Cottrell’s first Honor Flight was the D-Day 70th Anniversary flight June 6, 2014 to Bedford, Va.
Then came Arlington National Cemetery, where a special area for the Honor Flight veterans was roped off to watch the Changing of the Guard at the Tomb of the Unknowns. “Navy veteran Irving Caplan waived the opportunity to watch the Changing of the Guard ceremony,” he said. It turned out his brother, Air Force veteran Aaron Caplan, was buried at the cemetery, so an effort was quickly made to find the grave so Irving could visit it for the first time. The next stop was the World War II memorial, which opened in 2004. Many veterans had never been to the memorial or Washington, D.C., for that matter. But Galdys didn’t visit that one — he went instead with Army veteran Frank Cunningham from Stuart and the rest of the contingent of nine Korean War veterans, to shoot their group photo at the Korean War Memorial. There the veterans were given a private lecture on the history of the memorial before they head back to the WWII Memorial. Charlie Malpere and Robert Corveleyn, both 87, catch up after not seeing each other for 70 years since they graduated high school in Springfield, N.J. The two had an unexpected reunion after Corveleyn noticed Malpere’s name tag and have discovered that they live 5 miles from each other in Boynton Beach. Afterward, with everyone back on buses, they return to the airport to ready for their flight back. Before boarding the plane Galdys learned of an extraordinary reunion of sorts that took place earlier in the day. Two veterans, Charlie Malpere, 87 and Robert Corveleyn, also 87, had a unique Honor Flight experience to share with Galdys. It happens that at one point in the afternoon, Corveleyn noticed Malpere’s name tag, and said — “Charlie Malpere? I know your son,” said Corveleyn. “What son? I’m Charlie Malpere,” said Malpere. “You are?’ Corveleyn replied. “I’m Bob (Robert),” said Corveleyn. “He wasn’t an old man when I last saw him,” Corveleyn chuckled. Malpere recounts, ‘That started it. We started talking about who knows who, and so forth and so on. Where do you live? What do you do. What did you do. It just came out. It’s unbelievable. Seventy years! Before joining the Navy, the pair were classmates at Johnathan Dayton Regional High School in Springfield Township, N.J.
“When I asked how close they live from each other now, they replied, ‘5 miles in the same town, Boynton Beach, Florida,” said Galdys. With the whirlwind visit to Washington done, it was time to get back aboard the plane to take the veterans, guardians, staff and volunteers back home. They included notables like Fort Pierce Mayor Linda Hudson, and Port St. Lucie physician and long-time booster Dr. Shamsher Singh. Back on the plane, dinner was served, and then “mail call” held. This consisted of letters from family, friends and elected officials to make sure every veteran got mail, and it was held as closely as possible to real mail-call experiences, with everyone’s name called out loud, Galdys said. After “12 hours of intense activity, I had a bit of a headache and could feel the effects of only four hours of sleep,” Galdys said. But that vanished soon after landing at West Palm Beach airport. “We landed to yet another water-cannon salute. Immediately after exiting the plane I watched the final ceremony of the Flags of the Fallen. Gass and Hudnet met separately with families of the three deceased veterans as they presented each with the photo plaque and folded flag that flew with us on the Honor Flight and honored at the World War II memorial,” Galdys said. Retired firefighter Rick Gass presents the surviving family of Navy veteran Gene Calek with a photo plaque as Army Sgt. 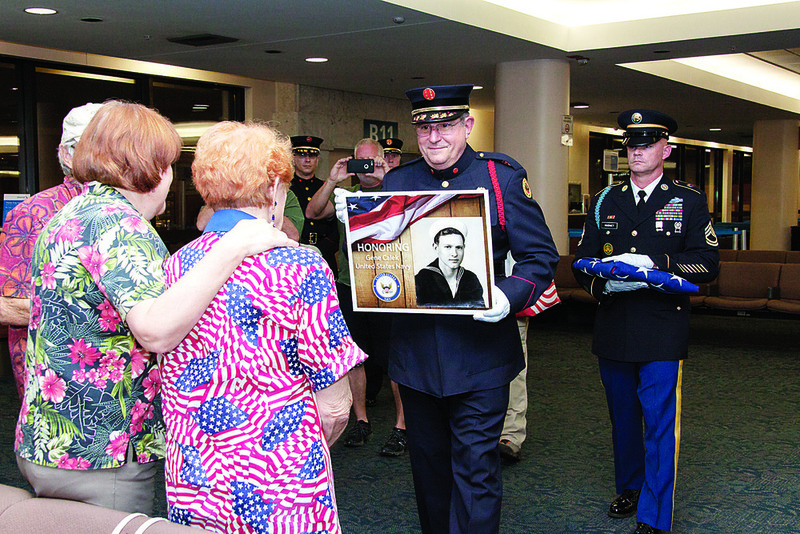 1st Class Daniel Hudnet follows with a folded flag Oct. 24 on the Southeast Florida Honor Flight. Led by the families from the Flags of the Fallen ceremony, a color guard, a bagpiper and drummers, the veterans began their walk out of Concourse C.
Galdys is a professional, and not one given to displays of emotion. But he said he was very moved by the whole experience of the Honor Flight, and it has made a lasting impression. “The Southeast Florida Honor Flight staff treated the veterans like the American heroes that they are. After all, they are The Greatest Generation,” Galdys said. “Photos can be viewed at the gallery button on honorflightsefl.org, and can be purchased as well to help keep funding going for future Honor Flights,” he said. Southeast Florida Honor Flight serves veterans living in Indian River, St. Lucie, Martin, Okeechobee and Palm Beach counties. If your veteran lives outside of these counties, please visit HonorFlight.org to find a hub near you.